Custom Printed Packing Tape- Campbell International Specialist Tapes. Our BEST QUALITY printed packing tape. Highly recommended. Our BEST VALUE printed packing tape. Value for money but with limitations. WATER RESISTANT rubber adhesive polypropylene tape. Able to withstand COLD and FREEZER conditions, ideal for food packaging. Please Contact Us with your requirements. To your door in 11 days from approval of artwork! We also offer many other bespoke/custom tapes including custom pipeline identification tapes and all-weather tapes. If you cannot find what you are looking for, have any questions or require custom tapes or bulk discounts please do not hesitate to contact us. Vinyl or PVC (Polyvinyl Chloride) printed packing tape is the best quality. White vinyl, in particular, has good UV resistance. Pantone colours can usually be matched so a wide range of printing is possible. We therefore recommend using vinyl tape for printing. It is stronger and thicker than polypropylene and has 2-dimensional strength. Vinyl PVC tape is usually coated with a natural rubber resin adhesive which is soft and flexible and therefore suitable for use in low temperatures such as cold stores. If used in low temperatures the tape should be applied at room temperature above 18 degrees centigrade before boxes or packets go into the cold store. Prices are for white, buff and clear tape with standard colour printing. Special colour matches are extra. Acrylic low-noise is the medium priced pressure sensitive tape, it features excellent clarity and resistance to yellowing. It may be applied in temperatures ranging from 32-140 degrees, is a great general purpose tape and is the favourite when carton appearance is an important consideration. Polypropylene tape is a thin tape which has some strength in one direction but once a split in the material occurs it loses its strength. There is limited colour matching available and a limited amount of coloured inks available. A value for money product with limitations. Our lowest price printed packing tape; hot melt tape, also known as synthetic rubber is manufactured with a non-low-noise polypropylene backing. Hot melt tape works well from 45-120 degrees, provides a good bond for most carton sealing applications and is the lowest cost pressure sensitive tape available. Hot melt may yellow with time, but will do so more slowly than natural rubber tape. Polypropylene tape is a thin tape which has some strength in one direction but once a split in the material occurs it loses its strength. There is limited colour matching available and a limited amount of coloured inks available. A value for money product with limitations. 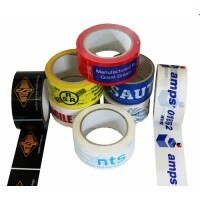 A branded general purpose and cost-effective general purpose packaging tape suitable for use in freezers. The solvent based adhesive provides excellent adhesion to polythene and general packaging. Aggressive adhesive coating ideal for polythene packing, bundling and sealing. Ideal for medium to heavy packages which require a high sealing performance. Excellent temperature resistance to hot and cold. All sizes & lengths are available on request. Please Contact Us with your requirements. We also offer many other bespoke/custom tapes including custom pipeline identification tapes and all-weather tapes, please do not hesitate to contact us.